Kermit the Frog would feel perfectly comfortable among the critters that inhabit Green Animals, a scenic, 7-acre estate and topiary garden overlooking Narragansett Bay in Rhode Island. Green Animals and its topiary garden, like many of the Newport Mansions, is operated by the Preservation Society of Newport County. However, its location in Portsmouth, about a 30-minute drive from the dense concentration of palatial properties on Bellevue Avenue in Newport, means it is often overlooked by Newport visitors. You shouldn't miss Green Animals, though, particularly if you are traveling with children. Here, the emphasis is not on a larger-than-life dwelling overflowing with elaborate furnishings and art but on the living creations that dwell in the historic and expansive gardens. Alice Brayton named her father's estate "Green Animals," a fitting name considering that about two dozen of the more than 80 topiary trees in the gardens are sculpted in the likeness of animals as diverse as an elephant, a unicorn, a teddy bear and a towering giraffe. Thomas Brayton, Treasurer of the Union Cotton Manufacturing Company in Fall River, Massachusetts, purchased the estate in 1872, and soon after, he commissioned an accomplished gardener from Portugal, Joseph Carreiro, to fashion imaginative animals and geometric figures to fill the gardens. The topiaries are shaped from California privet, yew and English boxwood trees. Carreiro was the superintendent of the property until his death in 1945, and he was succeeded by his son-in-law, George Mendonca, who continued to add to the collection of topiary treasures until his retirement in 1985. 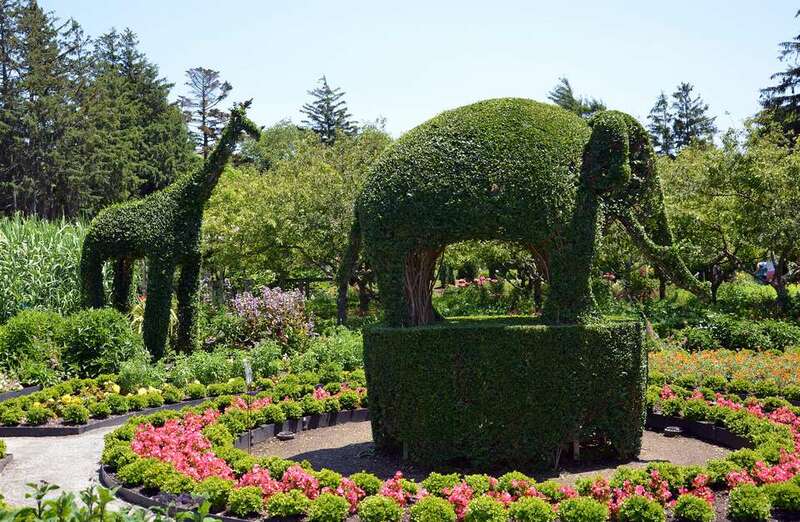 Green Animals is one of America's oldest topiary gardens, and it remains one of the most notable gardens of its type in the country. In 1940, Alice Brayton inherited the property, and upon her death in 1972, she willed the historic estate to the Preservation Society of Newport County, which continues to preserve and to welcome visitors to this unique property. Come along with me on a photo tour of Green Animals. Along the way, you'll see that in addition to the famed topiaries, the estate is also home to a variety of other historic gardens and a Victorian summer residence that is open for tours. If the kids are tired of touring old houses, they'll be happy to discover that the Preservation Society of Newport County's collection of antique toys is housed on the second floor. Getting There: Green Animals is located at 380 Cory's Lane in Portsmouth, Rhode Island, about 30 minutes from Newport's Bellevue Ave. From Newport, follow Route 114 North. After passing Raytheon, continue another 1.8 miles. Turn left at a light onto Cory's Lane. Green Animals is a half-mile in on the left. From Points North, follow Route 24 South to Route 114 South. Cory's Lane is the first right, at a light, after Route 24 South ends. Green Animals is a half- mile in on the left. When to Go: Green Animals is open daily from late June through Columbus Day from 10 a.m. until 6 p.m. (last self-guided tour admission is at 5 p.m.). Admission: Tickets may be purchased on site. You may want to take advantage of the savings realized by purchasing a combination ticket, which admits you to multiple mansions operated by the Preservation Society of Newport County. Combination tickets may be purchased at any property. Print-at-home tickets may also be purchased online before your trip. For More Information: Call The Preservation Society of Newport County at 401-847-1000.